An Engineer’s Thoughts on Key AGW Questions | Watts Up With That? In order for catastrophic climate alarm to prevail, three fundamental questions must all be answered in the affirmative. And even if they are all answered in the affirmative, it remains quite unclear that our actions and expenditure are wise or appropriate. Let’s examine various scenarios for the answers. 1. There is little need to examine the cases when two of the answers are no. Embarrassment will be high, usefulness low with similar best actions/solutions. 2. In all cases there are far more important and relevant issues to spend money on (as it is trivially within our means to further control microbes and insects). It’s microbes all the way down! Does the author seriously think that microbes can be controlled or even that they should? I am not sure what he means by Anthropogenic Control Opportunity but I assume he means that humans have a chance of controlling these organisms. In practical terms, however, control of humans is more likely than control of other mammals (no mention of birds, for example) and certainly more chance than controlling insects or microbes. Which microbes are we talking about? How are they to be controlled? What would happen to things like the carbon cycle if microbe populations were reduced. Nutrients would not be recycled. Carbon dioxide would not be returned to the atmosphere. Lower production of crops, starvation and death. And to think that environmentalists enjoy causing suffering and death. Perhaps the author should return to engineering rather than attempting to meddle with ecosystems of which he clearly knows nothing (“it is trivially within our means to further control microbes and insects” – perhaps this is a definition of trivial that will exist in a future dictionary) . This is pie in the sky nonsense and cannot go unchallenged. How in the sweet Christ do you propose that we have significant control over insect and microbe respiration? I believe you miss the point. The final three rows of the first table are the ones that matter. There is zero evidence that CO2 has had or will have any influence on climate – so the do nothing option is the one selected. This would release spending for those areas where we know people are already dying (including dying of cold as energy prices have necessarily skyrocketed ). Controlling bacteria and insecta I would agree is about as possible as carbon sequestration or carbon capture and storage. This is diabolical techie madness. Don’t tell me, you want to make legions of Terminator nanobots to kill the toughest and most adaptable life on Earth.. that we and the other fauna depend on. The kind of thinking that got us into environmental problems in the first place. Stick to making microchips, for everybody’s sake. Margaret , when he was saying “microbes”, I assumed he was referring to AGW catastrophists like yourself. This is a useful framing of the pertinent questions, but I wonder about the contention that it is ‘trivially within our means to further control microbes and insects’. Practically speaking, such a great deal of these populations are in difficult to reach geography and in difficult to access positions (e.g. soil) within these ecosystems. Ecologically speaking we know very little about dynamics at the microbe and insect level meaning any attempted manipulation (i.e. 6% reduction) has a high liklihood of either failing or having unintended consequences. Reducing microbe populations, particularly with a lasting effect, seems very non-trivial, perhaps impossible without making parking lots (which still have some but granted much lower). Get rid of one species and 10 others will take it’s place. If you are successful initially you may find a rebound in decomposition and gas exchange above pre-treatment levels as the living soil biomass dies and new microbes quickly decompose their dead cousins. I realize this is not the main point of this post but the ‘trivial’ suggestion takes aways from the rest. Without elaboration on how this reduction in microbes and insects could be accomplished the post is somewhat embarassing. Well said that man, took the words right out of my mouth! This is true. You can’t just eliminate a huge swath of the detritus food chain and expect that something else won’t step in that also undergoes respiration. To explain my comments for those that missed my point. To aim to reduce the population of microbes and insects by 6% is neither trivial nor possible. There are plenty of consequences to such an action that would not be low impact but those have been glossed over and ignored. Microbes do serve an important role in ecosystems and to deliberately reduce their population, even if it were possible, is unintelligent. Of course, I invited the even more crass comments by posting but since we are talking low life here perhaps it would be useful to understand what a reduction would mean. It would mean nothing. Just to destroy those life forms would mean their nutrients would be available for recycling which would mean an increase in the numbers of microbes. Or if you want to take that biomass out of the system, you need to find a way of doing it without enabling the decay process. You just cannot achieve it and to say that we can trivially do it means that the author has not bothered to think about it, research it or quantify it. “The number of viruses in a m3 of air ranged from 1,700,000 to 40,000,000, while the number of bacteria ranged from 860,000 to 11,000,000.” (http://whyevolutionistrue.wordpress.com/2012/10/11/planet-of-the-viruses/) That’s the air and there’s a lot of that before we even get to soil, rock, ice and water. And are we talking reducing the numbers of individuals or the biomass? Are we talking across the board decrease in all species or just selecting certain species? This is a brainless idea. I was assuming by the “trivially within our means to further control microbes and insects” quote to just be poorly worded. I’ve worked with engineers throughout my career and I have great respect for them. But the overwhelming majority can’t write very well. What I’m assuming he meant was that we have no ability whatsoever to control microbes or insects. But I’ll wait for clarification from the author. Where did the microbe and insect thing come from? This is the first time I’ve ever heard this mentioned. I’m actually extremely sceptical 🙂 that you could cut the population of microbes and insects by six percent in a controlled way without causing immense disruption to the entire ecology. The consideration of a source of a problem(s), while studying the problem, may cite factors over which one may never expect to achieve control, but, that does not diminish the importance or weight of the cited factor(s). Rather, it allows a perspective to be set which other sources may be contrasted against or compared for those elements or factors over which one *does* have the means to ‘control’ (although such control may be detrimental to economies et al). For example, we can expect to achieve little control over volcanic emissions, but, volcanic emissions can be cited as significant factors in contributing to airborne particulates / various aerosols, and release of a variety of GHGs, including CO2 and allow contrasts to be drawn against anthropogenic sources of the same materials. The BBC interviewed a microbiologist from Edinburgh who ststed that she had identified hundreds of bacteria living in soil and absolutely no idea what 95% of them actually did. So a good idea to leave them alone since they might even be, odds on, beneficial. Man should learn more about his planet and not try to change things he little understands. The law of Unintended Consequences looms large and wide. Engineers are wired to solve problems. However this proposed solution has “law of unintended consequences” written all over it. It is in fact, just the type of solution we are accustomed to expect from our green friends. The easiest “Anthropogenic Control Opportunity” is to go into the CRU and NOAA data sets and introduce a generally negative offsets distributed in bands around the world. Adjust your work until the models match the observed temperatures. The butchers thumb can solve all of hiss. Climate change alarmists are suggesting exactly that, controlling climate. Given that this rock is a water and insect world, how do you propose we “control” either? And should we? Extend that concept to “respiration” on a planetary scale. The Idsos point out that soil fungi are a not well accounted for carbon sink. Hansen’s picked out of thin (uncarbonated) air “safe level” of 350 ppm might in fact be half or less of an optimum CO2 concentration. You folks aren’t getting it and you obviously haven’t read my prior posts. Ian W is spot on. But let me ask you this. Let’s suppose that scenarios 1, 2 or 3 were reality. Hmm…let’s see, it’s us or them. And none of you can imagine how we might pare back to 96% the contribution of microbes or insects. Well, I guess we’ll just have to continue down the road of crippling the wealth and prosperity of all global human societies. A road where the very same bankrupt Models that assure us of catastrophe, also say that our crippling policy will delay that catastrophe by, oh, several hours out 100 years from now. It doesn’t seem so daunting from your comfortable positions. Never mind that we consciously deny clean water and basic sanitation to 1-2 BILLION in Africa and Asia. Which is an odd assumption. He quite expllicitly says that this is the best available solution. And since it isn’t even a vaguely plausible solution in any universe with which I’m familiar, perhaps all he’s saying is that we can do bugger-all about it. I think it’s unlikely that micro/insect populations are drivers of GHG levels rather than dependent. The author clearly says “it is trivially within our means to further control microbes and insects” which I cannot take to mean anything other than that he thinks it possible to control the population of microbes and insects. In the table he talks of anthropogenic control opportunities which I take to mean human control of populations. In seventy years of trying to control malaria carrying mosquitoes we have had limited success, for whatever reason (and I am sure some will remind me of the limitations on the use of DDT being one) and that is just one insect amongst many. Since interfering with ecosystems is generally not a good thing, the attempts to change populations of insects and microbes is hardly likely to reduce any problems that may be facing the Earth and the human population but increase them. That is outside of the immense expense involved in trying to reduce those populations by 6%. Perhaps the best option is to get people to go out with rolled up newspapers to try and swat any insects they come across. Like I said, it is ridiculous. It is based on ridiculous reasoning through all the three parts and the punchline just sums up how idiotic the ideas put forward are. Exterminating 6% of insects won’t mean there will be fewer emissions of CO2 from living things. There just won’t be. Before anyone does get on a high horse to shout Gaia at me, I don’t believe in that hypothesis. I don’t think the evidence is there for it. I do, however, note how difficult it is to exterminate large numbers of difficult to find organisms – those anthropogenic extinctions we can point to tend to be large or rare creatures (with some exceptions). I think climate change realists are suggesting putting the brakes on so that the chances of a crash are much reduced. Not a bad suggestion. How would I achieve this? Not burning so many fossil fuels for a kick off. I am not stupid enough (though I am sure there are many who doubt that and will throw it back in my face – where is Smokestack Lightning?) to think that it is easy or that we can really control the climate. What I do think is that it might be possible to mitigate some of the worst or most likely outcomes of rapid climate change, whatever version you might subscribe to. If, as someone suggests in another post, we have a 1740 type event just around the corner (highly unlikely but we’ll find out soon enough) then there would be good reasons to suggest taking action now to mitigate the problems that such an event will cause. That no government around the world will take the prediction seriously might give perspective on that event. And just because there are limited actions that we can take does not mean we should not take them. The author of the current piece assumes much. I would not want to try to assess the cost, in monetary and other terms, of the actions he proposes without actually saying so in as many words. It would be a very expensive feat even if it were possible. Of course, since so many here claim that the Earth is actually cooling, this is an academic exercise. But that’s not what I think the evidence says. Margaret Hardman, you don’t seem to understand the mentality of a large proportion of the commenters on this blog. You see, as I’ve found to my cost a number of times, if you express any doubt whatsoever about any issue that some poster has raised, you are by definition a CAGW supporter who must be lambasted at all costs. This tendency of attack-first-and-think-later is I suspect the main reason that Steve Mosher no longer bothers with complete answers to questions, as he knows how it will go down. It would appear that the Knut’s of climate change feel that they can moderate the changes in climate but that controlling insects and bacteria is a step too far. Perhaps they should remove the beam from their own eyes first? These are the important ones – and the action is to reallocate funds to emergencies that are demonstrably true and where people are already dying. I concluded Mr. Voisin was exposing the silliness of taking ‘action’ on CO2. Thank you for your articles. I spent 17 years in IC lithography, production and R&D, and can only have respect for anyone who have a successful career in the same. I had not read Ronald Voisin’s previous posts. I went back and reviewed them this morning and I think the only reasonable interpretation of his writing is that he actually is claiming that both microbial and insect CO2 emissions could be more easily controlled to produce the kind of reductions IPCC and allied groups are calling for than curtailing human industrial emissions. In other words, he really did mean what he said. He provides no detail on exactly what actions we could take to reduce microbial and insect emissions, what that would cost, how long it would take., etc. However, it is not reasonable to read Voisin’s posts as actually advocating such actions. Quite the contrary; he says multiple times that reducing human CO2 emissions is simply not worth pursuing because the benefit is dubious, regardless of cost. So it is fair to criticize him for making an unsupported assertion, but not for advocating reckless geo-engineering. Eat Them. And by that I mean that YOU eat them, I sure don’t want to. The beauty of the climatists’ war on manmade “carbon” is that the overall effect of their proposed energy policies will have the effect (intentional or not) of reducing human populations, particularly among the poor, producing a negative feedback effect. So relax, Warmies (you know who you are). No need to destroy any more microbes and insects than we already are. Perhaps if you took that chip off your shoulder and actually read the comments you might notice a whole bunch of climate skeptics also expressing extreme skepticism about this rather bizarre microbe and insect idea. What I find most annoying about many CAGW proponents is that they just don’t LISTEN. They are like little kids with their fingers in their ears shouting “neenah neenah I can’t hear you”. They attribute all sorts of motives to skeptics that we don’t have and assume we are all uneducated, ignorant and stupid. Instead of engaging in an intelligent discussion they simplty throw gratuitous insults. It is like trying to have an intelligent discussion with e two year old in the middle of a temper tantrum. Lets not get into a discussion about what “bugs” do for food for us. We’d have NO food, simple, and without them food would taste like chicken! Yet the greening of our planet is due to the scientific control of microbes and insects in food production to meet the demands of a growing population. But it cannot be done to combat CO2 . Do not say you have lost faith in your scientists. or maybe just in engineers ? because all their training in math and physics does not match the thinking of your goat entrails reading shaman!! Interfering with ecosystems, ie growing crops & livestock, is why there are seven billion people instead of five million. Or none, since even hunter-gatherers interfere with ecosystems, to the extent of causing extinctions in the large mammals which you cite. But not only humans interfere with ecosystems. Most if not all living things are parts of ecosystems & have an effect on their environments, sometimes catastrophic. The first oxygen-producing, photosynthetic organisms–cyanobacteria–almost wiped out all other life on this planet about 2.4 billion years ago, when natural sinks of O2 became saturated. Yet without cyanobacteria & the plants which rely on their organelle descendents, chloroplasts, oxygen-consuming animals like humans would not exist. “Climate change realists” aren’t. They deny the reality of climate change, which is that it happens all the time at various rates & humans have very little to do with it. If you are aware of evidence to the contrary, please state it. The IPCC surely does not. Consensus “climate scientists” point to GIGO models & cooked book data, then ask, “What else could it be but human-produced GHGs?” Real scientists would try to collect valid data, then look for plausible explanations, rather than making lame excuses for the failure of their hypothesis. You think the world is warming, not cooling. But in reality it’s doing both, depending upon the time scale. Earth is much colder now than for the vast majority of its existence, although there have been spells of extreme cold more severe than now, notably the Snowball Earth incidents, one of which (the Huronian Glaciation) coincided with the Oxygen Catastrophe mentioned above. That’s on the scale of billions of years. On the scale of hundreds & tens of millions, it’s also much colder now than usual. On the scale of the past two million years, we’re currently warmer than average, since we’re in an interglacial phase of the current glacial epoch. The Holocene is no different from any of the many previous interglacials. In fact, even at its hottest from eight to five thousand years ago, it was cooler than the Eemian interglacial which preceded it before the last glacial phase. (Glacials last five to ten times longer than interglacials.) The Eemian was warmer than the Holocene despite the lack of a Neanderthal industrial age. On the scale of three thousand years, Earth is cooling alarmingly. The Minoan Warm Period was hotter than the Modern WP. So were the Roman & Medieval WPs. The Little Ice Age Cool Period was colder than the Dark Ages CP. The trend is down, headed out of our present interglacial back into another big ice age glaciation. It is however warmer now that 320 years ago, during the depths of the LIA. It’s warmer than 160 years ago, at the end of the LIA. It is not however much warmer, if at all, than it was 80 years ago, which is why government record keepers need to “adjust” down temperature data from the 1930s. The CACCA hypothesis was falsified in the 1960s & ’70s when temperatures fell (also requiring recent “adjustments” upwards), despite rising CO2, & has been falsified again since 1995, since when temperature flat-lined & has now turned down. So during a brief period from the late 1970s or early ’80s to about 1995 naturally rising temperature just happened accidentally to coincide with rising CO2. Well, it wasn’t entirely accidental, since prior natural warming from the LIA depths caused most of the carbon dioxide increase. The human contribution is about four percent, with trivial climatic affect. I don’t know if Mr. Voisin was serious about reducing microbe & insect populations by six percent or not. If for some reason humanity did decide it wanted less of the beneficial plant food, life-giving gas CO2 in the air, increasing sequestration would be an easier fix than reducing emitters. But IMO doubling carbon dioxide from the low, low AD 1850 level would be more of a good thing, not a danger. I have seen guest posts deleted after a sh*tstorm of comments from people on this site. If it doesn’t pass the smell test, it gets rejected. As for Mosher, why don’t you ask him directly rather than speaking for him. He should have spoken of geoengineering measures plus adaptation measures, rather than reducing insects and microbes. An excellent pragmatic perspective by Ronald Voisin. Best solution? Design for known natural variations including climate persistence (Hurst Kolmogorov Dynamics) – i.e. recognize that HK standard deviations are about 2x larger than conventional statistical estimates of stand deviations. Then add a few percent margin to account for anthropogenic impacts. Otherwise, focus on providing replacement fuels to handle the rapid decline in conventional oil fields. A yet further global reduction in their competitive contribution by only ~6% would more than account for the otherwise complete elimination of our anthropogenic CO2 contribution in its entirety. And while this course of action is loaded with potential pitfalls, it is trivially within our anthropogenic means. We have already accumulated a great deal of experience in this regard and already have great insight to its pitfalls (something similar to but possibly much less drastic than what we have done in the lands we use for cultivation and occupation might be performed in certain other lands that we do not currently treat as such). It could likely be done in such a way as to yet further increase crop yields while further minimizing the spread of disease. Shouldn’t have to, but if we needed to, reduce bugs while improving crops. I know all too well the mentality of most commenters on this site. Perhaps this series of post are an elaborate Poe since even some of the faithful think this idea is rubbish. But why did it take three incoherent episodes to do so? And are we talking reducing the numbers of individuals or the biomass? Are we talking across the board decrease in all species or just selecting certain species? This is a brainless idea. In the table he talks of anthropogenic control opportunities which I take to mean human control of populations. Did you have the same problem with what these people have stated to meet CAGW?? 6 percent of the itty bitty guys or 50 to 95% of us? I believe your word should be “feel that” rather than “think”. Insects don’t depend on co2 concentration or on methane concentrations but pound for pound are the most prolific creators of those gases and there are unbelievable tons of them around. If you want to know about effects microbes have had, just look at the free oxygen on planet Earth. 21% of the atmosphere is free oxygen. Without that microscopic life creating oxygen as a waste product, you would have no animal that depends upon oxygen. As for our author suggesting that we wipe out 6% of the bugs, there was nothing present to cause me to believe it was a recommendation but rather a comment on how man fares compared to the bugs in contribution. He is quite specific in stating that any action is likely to be a total waste at best (and possibly catastrophic at worst). It is interesting how so many Malthusians have come out about how impossible and potentially catastrophic eliminating 6% of the bugs would be yet advocate positions that would cause the extermination of 90% of the human race evidently without ever having a single thought as to the consequences of their position. But let me carry on a bit from where I last commented. Let’s suppose that scenarios 1, 2 or 3 were reality. Hmm…let’s see, it’s us or them. Which will it be? Hmm. I’m still thinking. Now let’s be clear, global catastrophe IS coming in these three scenarios. It’s likely to impact microbes and insects as well as humans. In fact, according to some, we’re all going to die – we humans. Could it be reasonable to guess that the catastrophe itself might negatively impact microbes and insects by 6%? They’re pretty tuff you know. And it boils down to us or them you say. Well, no, not exactly. It’s 6% of them or just half of us. Hmm…I’m still thinking. Will I be part of the half of humanity that survives if we spare the 6% microbes and insects. That answer might affect how I vote this you know. Hmm, still thinking. When I was little I very much enjoyed playing with roley-poley’s and caterpillars. Hmm…and grasshoppers were always great fun. It’s a difficult decision. Just half of us or 6% of them? But none of you can imagine how we might pare back to 94% the contribution of microbes or insects. Hmm…that then settles it. Well, I guess we’ll just have to continue down the road of crippling the wealth and prosperity of all global human societies. A road where the very same bankrupt Models that assure us of catastrophe, also say that our crippling policy will delay that catastrophe by, oh, several hours out 100 years from now. Who should throw themselves onto their own sword first? That’s the next question to ask. This makes me want to see a chart “Millions of trees felled vs. CO2”. Probably by ‘pounds of wood felled’. Because that’s all termite food removed from the ecosystem … and then dumped back in there with the widespread elimination of logging. “I know all too well the mentality of most commenters on this site.” &etc. Agree w/Ian. It took Margaret only about 4 – 5 comments to get snarky. Why do you persist, if not to create a disturbance? By your own admission you will not get a fair shake from this crowd. You are clearly disingenuous and your persistence is juvenile. Does the author seriously think that microbes can be controlled…. THINK SWAMPS! Where there is water, there are microbes. Microbes, like other living organisms, need water to live and reproduce. Methanogens produce about one billion tonnes of methane every year. They thrive in oxygen-free environments like the guts of cows and sheep, humans and even termites. They live in swamps, bogs and lakes. “Increased human activity causes methane emissions to rise because methanogens grow well in rice paddies, sewage processing plants and landfill sites, which are all made by humans…. …Methane, a byproduct of natural gas drilling and of rice cultivation, is 20 times more potent as a greenhouse gas than carbon dioxide. This means that bang-for-the-buck in methane regulation is much better than in carbon regulation. This recent lecture by James Hansen of NASA, the leading academic on the left of the global warming debate, notes methane regulation has more short-term potential to slow climate change than does carbon regulation…. I think you may have missed my point or more likely I did not explain myself very well. It is because commenters will not pass up an opportunity to point out the flaws in a post that I appreciate this site so much. Many a topic has been ripped apart by regulars of this site if it warranted it. The same cannot be said for skeptical science et al. Bring back DDT. Carpet bomb. Problem solved! I can’t imagine any “Engineering Analysis” that that concerns itself with “Degree of Embarrassment”. “Proponent Embarrassment” is meaningless and unsupported result. “Best Available Solution” as a category? and “Usefulness of Trillions wasted”? These opinions and results are be supported in the earlier posts but it is meaningless to show a comparative analysis where the results in every case are the same. 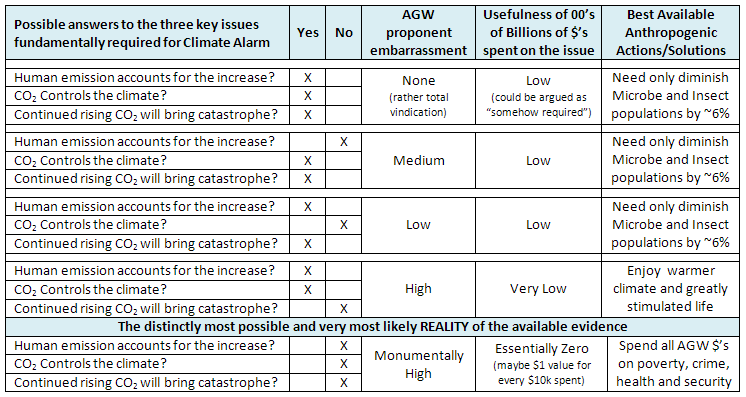 More importantly though it doesn’t seem useful as a engineering tool – it seems like a series of 4 engineering options presented with 4 “results” that are basically opinion and thinly disguised insults directed towards AGW / Global Warming proponents. What of engineering use is one to derive from this chart? Is there anything there that is presented as helpful as an aid to decision making? Costs? Or maybe I’m just clueless as to what this chart is accomplishing. Ronald, very interesting articles. You stirred up a real hornet’s nest (please forgive the pun!) with your ideas about exterminating 6% of insects! Exterminate mosquitoes after determining if they are not some part of an eco-system that we do not know about. They are horrible parasites that spread disease and do not have much going for them. Of course had the greens not had their way in the 1970’s(?) over the use of DDT, the Anopheles Mosquito, which spreads malaria would have been exterminated years ago, preventing many millions of unpleasant deaths. As someone mentioned previously, The Law of Unintended Consequences comes into play on both sides on this one. Like most people on this site I do not see any need to beggar human society on the ever increasing remote chance that CO2 is leading us to Armageddon. I would suggest suspending all windmill building, taxes on energy and all renewable energy expenditure until global warming starts up again, because after 17 years and 4 months it is not going to be soon. In my view this is a logical, practical and economic suggestion! My other suggestion is that this website exists for debate about AGW and rudeness to those who hold opposing views to us sceptics, in my view is not justified. Let the AGW websites be rude to us, let them ban us, they will only demonstrate their lack of tolerance and toys out of the pram attitude, which eventually will show them for the charlatans that they are. We do not need to stoop to their level! Let me continue the “Get rid of microbes/insects” idea. Again using methane being 20X as bad as CO2 you take all the sewage, food type garbage, animal manure and use Biogass Generation Terminology to turn all that waste into fertilizer and methane gas that is then burned for energy. An extended interview with L. John Fry, who as a pig farmer in South Africa in the late 1950s/early 1960s developed his own anaerobic methane digester technology to generate methane fuel from organic waste. … It took about five years to make the operation begin to pay. Then, when the enterprise started to become financially stable and I thought all my troubles were over, I found we had quite a problem on our hands … and that problem was getting rid of manure. We had two tons—wet weight—a day to dispose of and, at that time, there was no “official system” of using the material. I tried composting the waste from our hogs and found that it involved an enormous amount of work … four days labor a week. Then, as soon as we’d finished composting the manure, we had to put it out on the land … spread it and dig it in. The whole thing became a very big do. Along about that time I heard of experiments being done with methane digestion…. There were no smells, no odors, and no flies. The fly eggs that were already in the manure, you see, would go into the plant and that was the end of them. It was really remarkable, actually, how the fly menace cleared up on the farm over a period of a few months. There were practically no flies left….. The farm became quite a showplace and drew literally hundreds of visitors every year…. I think, if I recall correctly Fry produced enough power to run his farm. Because methane is 20X more potent compared to CO2, dealing with the anaerobic bacteria that produces them (SWAMPS!) and capturing and burning the methane generated makes a much more practical method of attack if Scenerio I or II is true. I enjoyed your trilogy of posts. As for insects, get rid of the termites located in human habitat areas. That would be a major improvement. Terminex can save the world LOL. The rest of the potential difference could be made up by exterminating all those dangerous potential murder/suicide type Malthusians. Both of those actions would lead to a better happier and safer world, regardless of whether or not co2 and man affects the climate in any meaningful way. Who should throw themselves onto their own sword first? That’s the next question to ask. Even with the internet I think it overly burdensome to answer this on an individual by individual basis. For the sake of expediency we might go to the national level (after we have eliminated all the AGW proponent volunteers who will most likely be fighting over who gets to go first). For example, Germany and Spain are already well on their way to throwing themselves onto their solar-voltaic swords. And the UK has thrown themselves onto their wind-power sword. Maybe these whole nations should go first. I mean, after all, France and Japan seem to be doing quite well with nuclear. And the USA’s newfound riches in fossil fuels will allow their inexpensive continuation. Remember that we only need to eliminate half of the human population and the other half gets to carry on business-as-usual. Nuking Germany, Spain and the UK plus the myriad anxious global AGW proponent volunteers will give us a good start. Oh, wait a minute, what about the microbes and insects in Germany, Spain and the UK? It seems to me that cockroaches are expected to survive neutron bombs. Certainly the Germans, Spanish and Brits will not. What about the other insects and microbes? Can anyone help me out here? Are neutron bombs the solution to ending global AGW catastrophe? I believe we should institute a global “Save the Planet, Stomp a bug” program. Its a Win Win, however… there is always the outside chance the “Men in Black, actually exists.. and we could start a intergalactic conflict. King Canute the Great was showing his subjects that his powers were limited. On topic, the three questions the author poses are simplistic, are they not? Since actual answers to the questions are much more nuanced than simple yes or no, reality is terribly complicated. I can’t imagine any “Engineering Analysis” that that concerns itself with “Degree of Embarrassment”. Ever presented directly to the customer? agree with Ian W and Gail Combs. as for Ms Hardman – any responses to her from us rational folk are sure to fail on deaf ears and/or blind eyes! Correctomundo. Rational folks cannot get through to Margaret. Please specify which nuances you imagine Voisin is missing in the answers to his questions. There is no evidence that climate is mainly driven by CO2 levels, & all the evidence in the world against this classic confusion of cause with effect. The human contribution to CO2 concentration is in any case minor. The warming observed since c. 1700 is natural, so no carbon-forced climate catastrophe looms. There was no runaway disaster when Earth enjoyed much higher levels of plant food in its atmosphere. None threatens now. Raional folks yes. I listen to rational folks. Those that reckon exterminating insects and microbes is trivially easy, no. Shari Lewis, yes. Not to worry. Tomorrow will bring another post that will bring the temple of AGW crashing down. Now shall I be more blameless than the Philistines, though I do them a displeasure. Catch 22. If I link to evidence, someone on this site will make a disparaging comment about the link. As someone said, the game is loaded and not in the favour of actual evidence. So I will post this link instead which probably won’t get rubbished so quickly and see if you see anyone in the mirror you know. I trust the Library of Congress (or PRISM, ooh, creepy name) is archiving all of this site so in fifty years time, when it comes time for historians to write the book that is the right of the victors, this site’s commenters will be providing plenty of material to understand what our Chinese friends are learning, the difference between skepticism and being a climate skeptic and I am not sure it will look pretty. If the anti-AGW case was so strong, it would have won over the climate scientists by now. Have you not wondered why those real working scientists who actually do the work don’t all rush over to the “skeptic” side? It’s not because their jobs depend on it, their tenures, their professorships. It’s because they value the truth, they value what the evidence tells them. Wondered why so much attention is now being focussed on ocean warming? Because that’s an inconvenient truth for the “skeptic” movement. The oceans are warming. This site moves from one pot shot at real science to another, several times a week. The climate scientists, like it or not, just plod along getting closer to what reality actually is. Forget the models. Forget the urban heat islands. Forget ant flatus. Perhaps you and others who use this site will not enjoy hearing that actually the impact of this site is more on a bunch of people who hang around on it rather than the people who spend their time on sometimes pretty paltry salaries really trying to make sense of it all. It would take one good piece of science to bring down the idea of AGW but it has to be coherent, rational, logical science backed by solid evidence. If the intelligent people here are so committed to finding it, look for it properly. I guess they must feel disappointed when the hype for the latest piece turns to ashes and dust. Well, I really like lobster, shrimp, and especially crab. All they are is overgrown aquatic insects. So, pass the hot butter, and the tiny little seafood crackers. What does the anti-vaccine movement have to do with skeptics of anti-scientific CACCA? The fact is that “climate scientists” are indeed suborned by money, ideology & pressure to conform. This sad truth is common in the history of science. If you disagree with skeptics who favor the scientific method, please offer actual physical evidence & reasoning for observations, ie facts, rather than appeals to the “authority” of those poor, suffering underpaid lying shills for the anti-human Green movement. Hansen has gotten rich off his unscientific activism & his co-conspirators fatten on grants, many from Big Oil. Arguments and debates are always more sensible with rational people – as opposed to those following some kind of zealous beliefs………seriously, Margaret (if that is your real name) – you will never convince people of a problem (whether it exists or not) by indefensible claims or lack of subject knowledge. And, for the record, I accept here that many do not have the detailed subject knowledge – but MANY here have the detailed knowledge of the core sections – which sadly the ‘climate science’ boys, more than often, do not – and hence, we can see through the charade. Until you and other warmist/alarmists educate yourselves , even in one core subject/section – you will never see through their so called ‘expertise’. More importantly, if you are not scientifically trained, you will not know even how to look for the errors and flaws in any presented data or conclusions thereof. Simply repeating the ‘party line’ is ineffective and demonstrates you are another one of the sheeple. sorry, but there it is…. and for what it’s worth, you may indeed snigger in a puerile fashion – but a real scientist never sniggers – he/she may kick himself for not spotting something, but a real scientist never sniggers at failure – it is indeed, a major part of the scientific method! Wrong. And it is clear that Margaret has no clue about human nature. Her “climate scientists” have been bought and paid for. They sold their souls for cash grants and fame. Anyone who cannot see that is blind. The evidence is found throughout thousands of Climategate emails. Next, there is no “anti-AGW” case; there is only the repeatedly debunked CO2=CAGW conjecture. Margaret doesn’t understand that skeptics have nothing to prove. The onus is entirely upon the climate scientists to post verifiable evidence supporting their conjecture. They have failed. There is zero testable, measurable scientific evidence showing that the rise in CO2 is the cause of global warming. If I am wrong, Margaret needs to post verifiable, testable scientific evidence demonstrating conclusively that CO2 is the cause of global warming. If she can post such evidence, she will be the first — and on the short list for a Nobel prize. Don’t hold your breath. That is not to say that CO2 has no effect. It certainly does, but that effect is felt primarily in the first 20 ppm. But at current CO2 concentrations, adding more of that tiny trace gas has no measurable effect. But so what? The oceans have been warming since well before the industrial revolution. Therefore, AGW has nothing to do with it. If it did, then the warming would be accelerating. But it is not; the rise is linear since the LIA. Once again, Margaret has the scientific method backward: the onus is completely on the alarmist crowd to explain why global warming has not accelerated, despite the ≈40% rise in [harmless, beneficial] CO2. Global warming has not accelerated, even following that large rise in “carbon” emissions. The alarmist crowd cannot explaiun how that can be, since their conjecture is that more CO2 will cause global warming to accelerate. In fact, there is no scientific evidence at all to support the belief in catastrophic AGW. People like Margaret, who flog that dead horse, fall back on invective in place of scientific evidence. Because there is no scientific evidence to support their quasi-religious belief system. None at all. It would take one good piece of science to bring down the idea of AGW but it has to be coherent, rational, logical science backed by solid evidence. No warming for 17 years is not solid evidence? 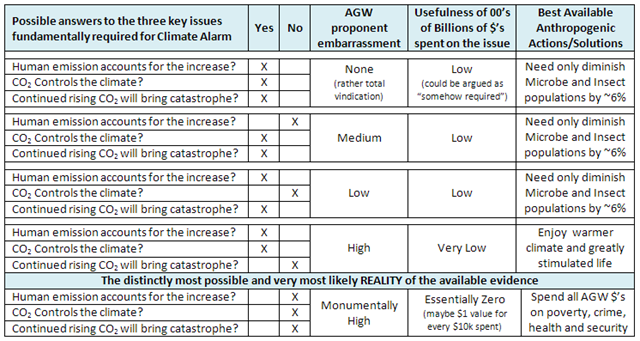 The AGW “idea” fails because there is no W.
Simple and understandable. Does man cause significant global warming? Is significant global warming an immediate serious problem? Amazing what the right sort of question can do at cutting through the gray bland nothing. Simple yes/no questions work wonders at helping to bring some things into focus. Basically, if the answer to either is no, there is nothing there to worry about unless you just want to worry about it rather than something that represents a real threat. It’s not like there aren’t real threats, including the health risk of worrying. Hm, point 2 is creating confusion. So what I understand now, reviewing this part is that we do currently affect the CO2 balance, through affecting the life of insects and microbes. There is no call for doing more, but to face the situation that we have greatly reduced the number of insects and thus reduced CO2 emissions. I see this 20 X methane badness factor all the time. Just what does that mean ? To me, it would mean that a single CH4 molecule in the atmosphere captures 20 X “the LWIR spectrum energy emitted by the earth’s mean global Temperature (surface or lower troposphere) region, than does a single CO2 molecule. Now I’ve seen atmospheric LW absorption spectra, showing the “methane band”, along with the ozone band, the CO2 Band, and the water bands, and I’ve never seen such a plot, that indicates, that methane captures a wide swath of that spectrum. At MGT of 288 K, the LWIR spectrum peaks at 10.1 microns wavelength, when plotted on a wavelength scale. Chemists seem to prefer plotting spectra on a frequency scale, including theoretical black body spectra. I say theoretical, since nobody ever observed a real black body spectrum. Now when plotted on a frequency scale, the spectral peak, is at quite a different photon energy position, than when plotted on a wavelength scale. That is because what is plotted is Watts per square meter, per wave number, or watts per square meter per micron. The CO2 bending mode(s) band stretches from about 13.5 to 16.5 microns, out of a total LWIR spectrum from about 5.05 microns, to 80.8 microns; 1/2 the peak, to 8 times the peak wavelength, wherein lies 98% of a BB like spectrum energy. But the CO2 band has more microns half power width, than does the ozone band at 9.6 microns. There’s some good reasons for that. The CO2 band is largely represented by the surface atmospheric pressure and Temperature, so the spectral lines are both Doppler and collision broadened. The ozone band, however is due to a relatively thin colder less dense high altitude atmospheric layer, so the ozone band undergoes less Doppler, (Temperature) broadening, as well as less collision, (density) broadening. When plotted on a frequency (wave number) scale, the CO2 band is a lower frequency than the ozone band, and the half power bandwidth is a smaller number of wavenumbers (cm^-1), so the peak value per cm^-1 plots higher. I am a scientist myself, although not a climate scientist. Usually as a scientist you defer to others in their area of expertise because a scientist appreciates just how expert an expert really is. However as scientists we are not obliged to take the word of anyone for anything. “Nullius in verba” is a philosphy that I deeply believe in, although it now seems the Royal Society does not. I defer to experts when I see them behaving as rational scientists should behave, answering questions in a reasonable fashion and explaining what they do in as much detail as their audience can understand. But when I see a bunch of scientists behaving like condescending gits, refusing to explain themselves, sneering at those who ask legitimate questions, involving themselves deeply in politics, claiming certainty where there clearly is none, indulging in science by press release, speaking in intemperate language and coming up with ridiculous statements like “the science is solved” then all bets are off. When skeptics were first called “deniers” – that is when this branch of science completely lost my trust and I starting to look at what was being said in this area with extreme … skepticism. The problem in my opinion is that we have here a failure of the institutions of science. Who are these largely self appointed politically motivated people who claim to speak for science itself? I didn’t vote for them! Science is a rational method – an approach to answering questions and thinking about the world. It isn’t a political movement with policies and leaders who speak for it, and it isn’t a church with a dogma and a priesthood handing down revealed truth from on high. But that is how some highly placed people within the institutions of science have been behaving, using their positions to push what seems to be a political agenda and destroying the credibility of science in the process. Typically scientists speak in a very reserved language. You don’t make wild grand claims. You say only what you know and can prove and not a word more, and you explicitly acknowledge the limits of your certainty. You often have to read between the lines to figure out the implications of what a true scientist is saying – so reserved is the language. There are many good scientists out there still behaving in this way and if you read between the lines of what they are saying the message is consistently – we don’t know – the errors are too large – we don’t have enough data – the models are not accurate or reliable – the climate isn’t behaving as predicted. But these rational people engaging in real science are being completely drowned out by a bunch of people in the area doing “postmodern science” – which seems to involve starting with politically motivated conclusions and attempting to justify them. Sadly these postmodern cuckoos in the scientific nest are being approvingly nourished by the politically motivated gits running our scientific institutions and they are pushing the real scientists out into the cold. Look at Gleick, Mann, Lewandowsky – all rewarded handsomely for doing really bad science. Look at McKitrick – vilified for doing good science – just read his demolition of Mann’s hockey stick. That was a really good bit of science. I care not that his background is in industry. Good science is good science. So where do we draw the limits on scepticism. Scepticism can indeed be used as a cloak for an irrational and closed minded rejection of results where the scientific case is compelling. There are those for example in the evolution area who cannot be convinced by rational argument, and this example troubles me. I think many of those new come to tghis debate assume that climate sceptics are just like this. How can I distinguish my skepticism from theirs. My conclusion is that you really cannot tell whether my mind is open from the outside; what my motivations are and whether my doubts are honest or not. But you CAN look at the behavior of the scientists in the area and see how they respond to questions. A Biologist may get very tired of answering the sometimes duplicitous questions of a creationist, but there is no doubt that all those questions do have reasonable and rational answers. You might get tired of whacking moles, but I have yet to see a mole that couldn’t be whacked. Yet consider these very reasonable questions of skeptics that have NOT been rationally answered. 1. What evidence is there is that the overall feedback from water vapour is positive rather than negative. All the evidence that I have seen on this matter points the other way. 2. Why is a couple of extra degrees a calamity when warmer weather has generally been hospitable for life and the planet has been much warmer in the past? 3. We are approaching the end of the interglacial shouldn’t we be glad that a slight increase in the greenhouse effect might stave off that natural calamity? 4. Why are ensembles of GCMs still being used as predictors when they are so poor at explaining natural climatic variation and have been invalidated by the actual climatic behavior in the 21st century. 5. Hasn’t the late 20th century warming and CO2 increase ramped up agricultural production? Where is the evidence of a problem? 6. Sandy wasn’t even a hurricane when it made landfall. On what basis are you attributing it to CO2. Hurricanes have declined in recent years. Didn’t you predict they were supposed to increase? 7. Tornadoes have not been increasing in frequency. The GCMs don’t predict that they should increase. On what basis are you claiming these as a signature of climate change. 8. Upper troposphere temperatures have decreased – they were predicted to increase. The increase is linked to the supposed amplification of the greenhouse effect by water vapour. Isn’t this a serious problem with the models? Doesn’t this show that water vapour is NOT amplifying the greenhouse effect and that therefore CO2 emission is not a problem. 9. Why are you attributing all of the 20th century warming to the greenhouse effect when much of it happened before the burning of significant amounts of fossil fuels and when it clearly continues the pattern of recovery from the LIA. 10. Why are you claiming that sea level rise is accelerating when if anything it seem to be decellerating. 11. 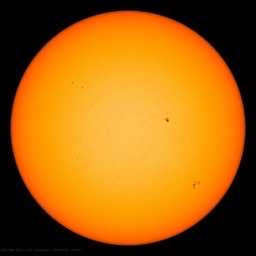 The link between solar minimums and periods of drastic cooling has been noted before. Recently progress has been made in suggesting a possible mechanism. Since we are just entering one of these quiet periods like the mauder minimum shouldn’t we be more concerned about the possibility of sudden cooling? 12. Didn’t you guys say a few years back that we wouldn’t know what snow was. How can you now claim heavy snowfalls as evidence of global warming. It seems like you are claiming warmer and colder, floods and droughts, storms and mild weather all as evidence of climate change. Isn’t this a trifle inconsistent? 13 How can your theory be invalidated? Didn’t you say 15 years without warming would do it? Haven’t we just had that? Consider also the nature of the response when questions like this are asked. Ad hominems and abuse are not acceptable responses. Responses of the realclimate variety like “here is a list of thirty academic paywalled papers – your answer is in there somewhere but I’m not going to condescend to explain it because you are too stupid to understand it” is not an acceptable response. Feynmann explained quantum electrodynamics to laymen! Don’t try to tell me that you can’t explain the weather. I guess what I’m asking you Margaret is, as a scientist, please turn that critical eye of yours onto climate science. Do these guys meet your standards of proper scientific behavior? Because they don’t meet mine. At some point someone should comment about the last set of entries in the second table. Not a viable choice for action that has an effect on CO2 levels great enough to cause a measurable temperature variation. The Ultimate consequence of totalitarianism is, if fact, the single path we are currently going down. Look at Gleick, Mann, Lewandowsky – all rewarded handsomely for doing really bad science. Actually I’d like to modify this statement as it isn’t co,pletely accurate and I wouldn’t want to libel anyone. Only two of the people on that list were rewarded for doing bad science. Gleick was rewarded for being a good thief. What a silly post. Initially I thought, “Bad use of WUWT space in my opinion.” However, I then thought that airing of nonsense stuff like this article gives us skeptics a chance to call out the idiots on OUR side! Um.. the human body is over 30% microbes by weight, most of them essential to its continued healthy existence, (likewise the bodies of all those cattle and sheep and pigs and chickens we raise for our own consumption). Cyanide anyone? The only quick and simple engineering solution that I could imagine to comprehensively reduce the microbe and insect populations over several per cent of the earth’s surface would be a nuclear war. An elegant solution, but probably not a very good idea. PS: Bacteria do tend to limit microscopic fungi. Fungi left uncontrolled do sometimes destroy pollinating insects. Stockfeed plants, vegetables, etc. do rather depend on pollinating insects in order to reproduce. Cattle, sheep, pigs and chooks do rather depend upon stockfeed. People do rather depend upon meat and vegetables. It’s an elegant engineering solution, but it could all go horribly wrong.. This is not my solution. And neither is what we are so far doing. Humans easily account for the CO2 increase, mostly by burning fossil fuels. Nature is removing from the atmosphere some of the CO2 that humans are adding to the atmosphere. What I see more as a matter of debate is how much CO2 controls the climate, and how bad things will get if we don’t do something about CO2. I see increase of CO2 having about 40% as much effect as claimed by most proponents of existence of anthropogenic global warming via CO2. One factor I see is the periodic cycle that shows in HadCRUT3, explaining about 40-50% of the increase in HadCRUT3 from 1973 to 2005. Another is that about 20% of the man-made growth of greenhouse gas effect from the 1960’s to the 1990’s was from non-CO2 greenhouse gases whose increase was largely stalled in the 1990’s. Insufficient correction for growth of urban heat islands and low sampling in less-warming parts of the world could account for a little. actually as I see it, then doing nothing about it is sufficient to prevent a big catastrophe. become future fossil fuels, or wood to build things from faster than existing wooden structures decay? I see your link, and raise you Salby. And yes, I agree that what we are currently doing is probably not a solution, possibly because there is no problem of our making, in which case nature will take its course regardless of what we say or do, and definitely because the only tangible effect of what we have done here in Australia has been to annoy me by putting up my electricity bill. On the other hand though, not all global efforts have been futile. If nothing else, this modern scientific controversy (why are they always so heated?) has directed a lot of money, time and mental effort towards the more detailed study and understanding of our planet, including the launching and placement of some very useful monitoring hardware that is gathering a great deal of fundamental data that we might not otherwise have had. I’d rather see the money spent on that sort of hard science than on a ruinous and ultimately futile military misadventure into SE Asia or the Middle East. Good for you to try to correct the widespread misunderstanding of the King Canute story. I hope your attempt works. Mine (about a month ago), worded similarly to yours, did not. Within a day or two, the Canute mistake was being cited in main posts and in comments over and over. I decided King Canute’s reputation wasn’t a battle worth fighting. Glad to see someone else trying. Good luck! I admit it. I’ve been having a good laugh at “Margaret Hardman” filling the role of Jai Mitchell in this thread. Though to be fair, MH hasn’t been the only person to form a silly tunnel vision over the 6% bug solution. But MH, did comment on the mentality of commentators here, then tosses out the famous: if only -sceptics- would provide some evidence. Sheesh. I though perhaps, if MH has some actual evidence proving CAGW she should call a press conference because she would be the first person to produce evidence. Or to quote the always top-notch dbstealey…..
No, we can’t imagine such a thing, but you clearly think you know how. In your last posts you claimed we were limiting significantly the amount of respiration undergone by microbes and insects. So please, elaborate on how it is trivially easy to do such a thing. Your central claim of humans not being the reason for the rise in CO2 implies that you know more about the carbon cycle than….everyone. Enlighten us. Where is the carbon that these guys would have emitted currently located? How would you go about cutting CO2 levels through the “bugs” and bugs? Well I imagine the bug killing thing is going to create some drama. Since that seemed to pull the focus on the entire 3 installment post. I would say though that the real gem in this post is the postulated embarrassment to the AGW proponents. The reason being it explains why, after the models that were designed to test the CO2 AGW theory showed that CO2 with a positive water vapor feedback were wrong. The AGW crowd refused to go back to the drawing board. The embarrassment being too high and the possible negative consequences being so drastic as to ensure that they would cling desperately to their pretty theory. For those that need a reminder here is faynman on the scientific method. The subject of microbe control was raised with the comment that this engineer should go back to school. I present this little exercise in schooling for the person who made the comment. 1) Solid waste management (garbage management) can be designed to reduce methane emissions that result from decomposition of biomass by micro-organisms. More methane results from anaerobic processes than from aerobic processes. Thus well-managed waste sites form windrow that they aerate mechanically. 2) Rice paddy fields have been estimated to generate 40% of atmospheric methane. [I do not vouch for this specific figure.] Bacterial decompostion under anaerobic conditions again. By careful management of water during the growing season, specifically draining the fields early, it is possible to increase rice production and reduce the level of methane emitted. I hypothesize that as the land under rice cultivation and water availability have reached near the maximum some countries (China, Japan, Korea) have already improved the water management tecniques and this may be why the rate of increase of atmospheric methane seems to have declined. Space and time limit the text, but once one has the idea that bacteria have a role in GHG production it is possible to appreciate their importance. The moral of the story is, of course, “Don’t knock someone in their own field unless you do your homework”. Ian H, a very good reply to Margaret’s comments. I would like to add the following. Science has been driven by bigotry for centuries. Copernicus would not publish his book confirming the Sun as centre of the solar system until after his death for fear of retribution. Giordano Bruno was burned at the stake for agreeing with him. Modern science is full of this same bigotry AGW and passive smoking are two such examples. I will reiterate what I have said many times before; Margaret do you really think we should reduce the Western economies to levels that they were in the nineteenth century because of AGW theory, which has fallen at every single hurdle when it has been put to the test? Do you think impoverishing old people by hiking their fuel bills is good? You see I don’t, which is why I and many others are so vociferous on this website. The warmists remind me very much of the unilateral nuclear disarmers of the 80’s, in fact I am sure they are the same people, they were wrong then and they are wrong now! Agree absolutely ! – but of course, if they form themselves into a ‘group’ and shout loudly enough about how ‘we are the consensus !’ – that makes everything they say correct? They are Muppets, the lot of ’em. well said. For my money, the point being made here re ‘bugs’ is mostly one of ‘scale’ – which all the alarmists constantly want to sweep under the carpet. Of the zillions of tonnes of carbon in the actual biosphere and the constant natural shuffling about of said carbon – the anthropogenic percentage is tiny. I know all too well the mentality of most commenters on this site. The presumption being that the mentality of most commenters on this site are wrong while yours is right? Why don’t you take your arrogance somewhere else where it will be appreciated. It would seem that most of the above believe in the GHE theory and the Precautionary Principle. The former has been disproved by 17 years of temperature plateauing and the latter is NOT a scientific principle. Reality is a great teacher unfortunately many do not wish to learn. The facts are that data does not follow the models. This means that it is the models that are WRONG not the data. The models are wrong because of the wrong assumptions. Ian, excellent answer, in my view it deserves to be elevated as a main post itself to have more visibility, as it explains so very clearly what many think about CAGW and why they are skeptical of the CAGW movement. I find this is one of the most important strengths of WUWT to find so many valuable comments in the threads! What some people fail to recognize is that nature always seeks equilibrium. If we tried to eliminate those wonderful bugs they would just reproduce quicker. We would fail just like many of the other CO2 sequestration ideas. However, the discussion is a good one and Mr. Voisin should be commended for his contribution. Now, speaking of equilibrium. The current level of CO2 is also part of an equilibrium situation. It’s amazing that so many intelligent people don’t get that. If we weren’t increasing the CO2 level something else would. Very possibly led by the bugs mentioned in the article. The real reason CO2 is higher is because a warmer world needs it to be more productive so nature adjusts. The biosphere hasn’t been around for a billion years by accident. Ian H, very nice. Hits most of my views perfectly. As Lars P. says it would be a great main post. It would be interesting to see the true believers try and answer those points. Likely they would all be silent. “Man causes global warming” or “Man can stop global warming”. This is as funny as it gets. You don’t have to believe in Mother Gaia to recognize that Earth systems are homeostatic. The planet regulates its own temperature, thanks in large part to the plenitude of solid & liquid water on its surface & vapor & droplets in its atmosphere. The effect of CO2 at anything below maximum Precambrian levels is negligible compared to the cooling & heating effects of water in all its forms. As allegedly “well-mixed” carbon dioxide approaches 400 ppm, supposedly up from 285 ppm at the end of the LIA, water vapor in the tropics tops out at 40,000 ppm, totally swamping out any effect from the piddling amount of beneficial plant food in the air there. The GIGO GCM modelers admit to ignoring clouds, one of the most important self-regulatory mechanisms, & worse yet make a 180 degrees Wrong Way Hansen assumption about the feedback effect of evaporation. “Climate science” would be a laughingstock had its anti-scientific insanity not cost humanity so much already. Models rely on the assumption that CO2 drives climate/temperature and this is why the models are wrong. Our production of CO2 is but 3% of the overall annual budget with most from the oceans. But CO2 does not matter because it does not drive climate/temperature. Climatologists believe the flat earth AR4 energy model (K&T) which is a complete abortion in that it does not represent reality which is a rotating spherical planet with day/night cycles providing energy to one face/hemisphere at a time. Reality provides more than enough energy for the average 14C temperature. Hansen misunderstood the atmosphere of Venus. It is not its CO2 content that retains heat, but its mass, which is practically oceanic. The thin atmosphere of Mars is also about 95% CO2, but it’s cold. Earth’s blanket of air is about two orders of magnitude less massive than Venus’ & two order of magnitude more massive than Mars’. As is often noted, at the point in the Venusian atmosphere where its mass approximates Earth’s surface pressure, its temperature resembles our planet’s surface. Mass matters. Carbon dioxide, not so much. For heat, that is. For life, it’s vital, though in trace amounts. Let me continue the “Get rid of microbes/insects” idea…. I see this 20 X methane badness factor all the time. Just what does that mean ?…..
George, I agree with you. I was pulling a ‘Lord Monckton’ Given the CAGW universe what can be done…. My 6 wheel wide pickup (called a dually) is usually hitched to a live stocktrailer. It gets 22 MPG. All the rest of my vehicles are pickup trucks. I gave up on passenger cars as being utterly useless. As for grocery shopping with a pickup, I make a list. First stop is ~ a 1/2 ton of livestock feed then the hardware store and finally the groc. store. What you are actually saying is that I should apply to some little Hittler bureaucrat and tell him WHY I need a pickup before I am allowed to purchase one. No doubt this is going to be the same as applying for a medical procedure where a bureaucrat NOT a doctor decides whether a procedure is called for. We are already seeing this in the UK. It is bad enough Doctors bureaucrats are deciding to end the life of old folks but now the target is sick children. Children placed on controversial ‘death pathway’: Sick children are being placed on a controversial end-of-life “pathway” previously only thought to have been used for elderly and terminally-ill adult patients. In other words humans are to be managed and treated as a farmer would his livestock. If it does not make him money kill it. Another word for this is SLAVERY. Respect for private property was enshrined as a civil right, due to the understanding that if you cannot own property, you are property. Once the government/banks attaches all sorts of cravats on ‘Owning Property’ you no longer actually own it since it can easily be taken away from you and in many cases you do not even have the right to a trial by jury in the USA. The right to trial by jury is not constitutionally guaranteed in certain classes of civil cases that are concededly “suits at common law,” particularly when “public” or governmental rights are at issue and if one cannot find eighteenth-century precedent for jury participation in those cases. Atlas Roofing Co. v. Occupational Safety & Health Review Commission (1977). Thus, Congress can lodge personal and property claims against the United States in non-Article III courts with no jury component. In addition, where practice as it existed in 1791 “provides no clear answer,” the rule is that “[o]nly those incidents which are regarded as fundamental, as inherent in and of the essence of the system of trial by jury, are placed beyond the reach of the legislature.” Markman v. Westview Instruments (1996). In those situations, too, the Seventh Amendment does not restrain congressional choice. I am so glad you have made it clear you support serfdom even though I am sure you do not even realize you do. I would suggest you read Robin’s site Invisible Serfs Collar The best serfs are those who are brain washed to accept their serf’s collar willingly and that has been the goal ever since Fabian John Dewey revamped the US education system. Rosa Koire, a democrat and California bureaucrat spells out exactly how the government is building the new serfdom society. Your government is a corporatocracy, a new authoritarian state in the process of consolidating your output into a more controllable, exploitable channel. The reason you are being misled by your government and told that all of this is good for you, is because there is no profit in managing a mass uprising. It is too disruptive. The markets want you to continue to consume—quietly and obediently…. The pretty pastel vision of life in a Smart Growth development is a manipulation, a mask. In fact these plans are designed to restrict your freedom of movement and choice. Transit villages (formerly known as cities) will be restricted to having only the population that can be supported by food grown within a 100 mile radius (called a ‘food shed’). Food sheds will dictate where you can live and when you can change your residence. Calculations, such as those done recently at Cornell University, will determine how much food can be grown within that area and then the Transit Village population will be limited to the number of people who can be fed by that land (click on the blue to go to the Cornell website). It is reasonable to expect rationing based on this mode. If you want to move to that village you will have to apply and wait for an opening…. What some people fail to recognize is that nature always seeks equilibrium. If we tried to eliminate those wonderful bugs they would just reproduce quicker…. For microbes you change the amount of water/sunlight. If you want bio-methane to burnand generate electricity you use a sealed slurry pit and draw of the gas to be burned. The engineering has already been done and digesters are commercially available link This as far as I am concerned is much better that BURNING trees because the other product is fertilizer to be placed back on the fields. I think a much more viable, effective and profitable way how to get rid of the CO2 emissions than to kill microbes and insects would be to use LFTR for energy production instead of hydrocarbon fossil fuels, which anyway will be depleted in just several decades. There’s over kilogram of microbes living in our body, most of them beneficial. How much we would harm ourselves killing the ~6% of them? If we idiotically came to conclude that CO2 must be reduced, we could obviously do so in various lands where we have not already do so. We have >50 years of understanding as to the intended/unintended consequence of this proposal (unlike the alternatives). And this effort would be much more pointed and much more informed than we currently perform. Let’s do what’s right – nothing at all, other than more well preparing for inevitable and unpredictable climate change. The surface atmospheric pressure of Venus is 90atmospheres, about the same as that at 300m in the oceans. Enough to squash a boomer. Yes, adiabatic compressive heating has a lot to answer for.